The Thistle Thread Kits (Zecca ZE 178) have been assembled. Thanks to these wonderful thread and bead companies for their donations: Kreinik, Sundance Designs, Crescent Colours, DMC Corporation, and Rainbow Gallery. Did someone say Kits? Yes, 20 of them... plus Lana. And... Leo. Both are good helpers. 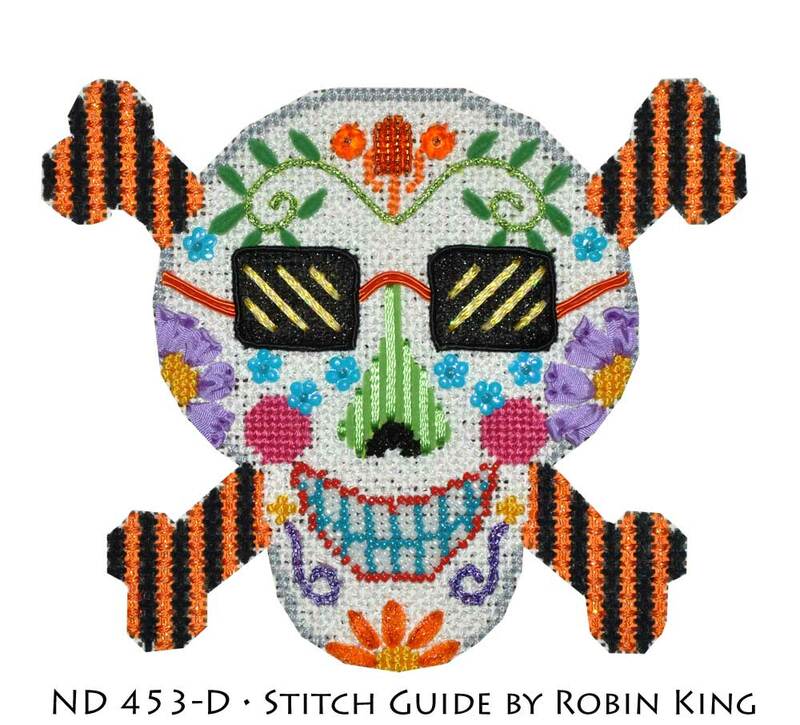 The Sunglasses Sugar Skull Thread Kits (NeedleDeeva ND 453-D) were assembled, too. 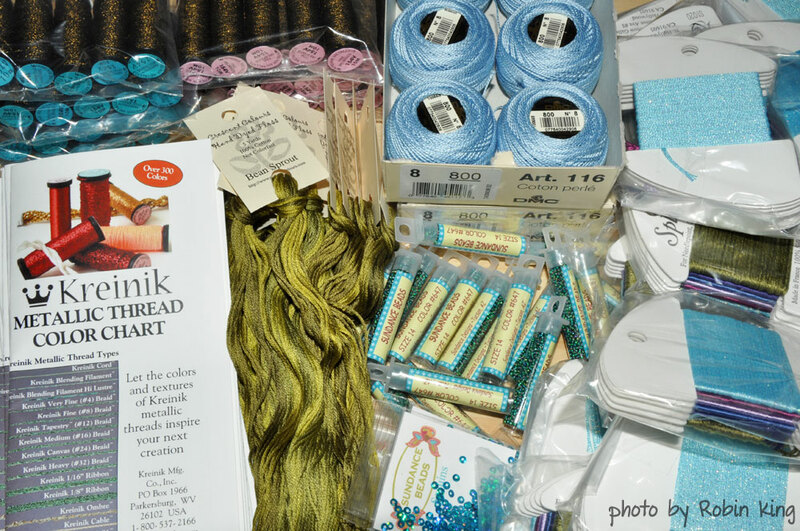 Thanks to these wonderful thread and bead companies for their donations: Kreinik, Sundance Designs, Wichelt Imports, DMC Corporation, River Silks Ribbons, The Collection Designs, and Rainbow Gallery. It is very helpful having a large work space when assembling these 20 thread kits. 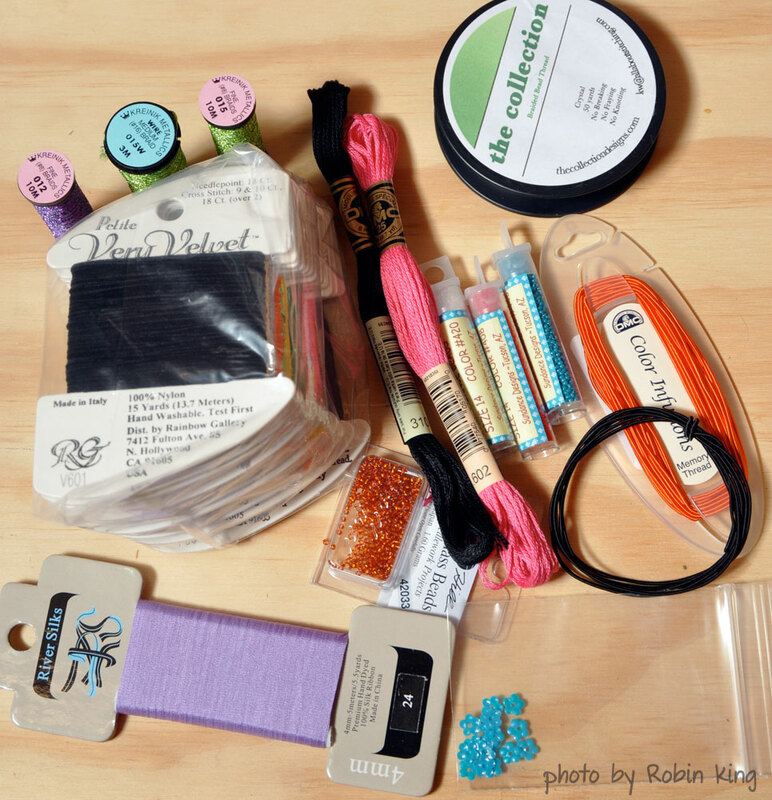 Next on my To-Do List for TNNA/Long Beach: get my Meet The Teacher items together. I am participating in this event: Friday, February 1, from 5:00PM - 6:30PM. Hopefully, shop owners will stop by my table, meet and consider me for future teaching events in their stores. Fingers crossed. 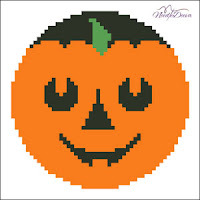 If you are reading this blog, mention my teaching availability to your Favorite Needlepoint Shop. Thanks! 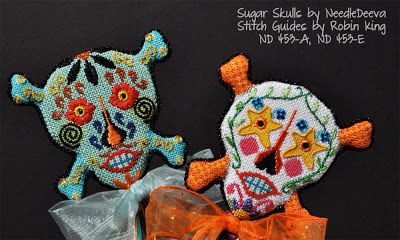 The Sugar Skulls came back from the finisher. Join me in doing my Happy Dance. Thanks to the entire team at Elizabeth Turner Collection; record speed and awesome results, indeed. The Sugar Skulls (from NeedleDeeva) will be on display (Booths 1261/1360) during the TNNA Market in Long Beach, CA. 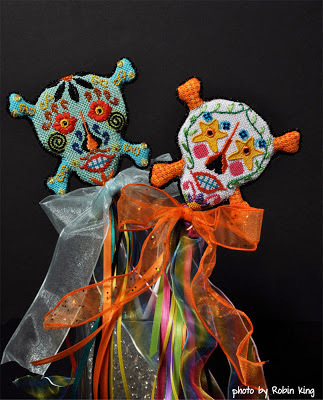 Each of the Skulls were finished on a stick with fun, decorative ribbons. I am using a clear vase with small clear glass marbles. Just stick in and enjoy. Leo is on set supervising the photo shoot. "OK, look at the camera and smile." Someone is "mugging" for attention. Market is in one week. 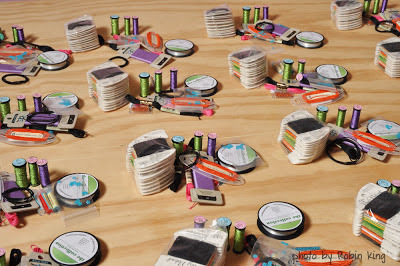 Tomorrow I will make the thread kits for the two classes. There are still seats available for both classes. Come spend the morning 8AM - 10AM with me (Saturday/Sugar Skull and Sunday/Thistle). Wanted to share this with those of you attending TNNA/Long Beach 2013... and those who aren't. Hug Me Company (a New Orleans based company) won't be attending TNNA/Long Beach 2013; instead they will be hosting a fabulous Super Bowl party in New Orleans. "Hug Me is located in New Orleans. The Super Bowl is in New Orleans. So we're in New Orleans!" 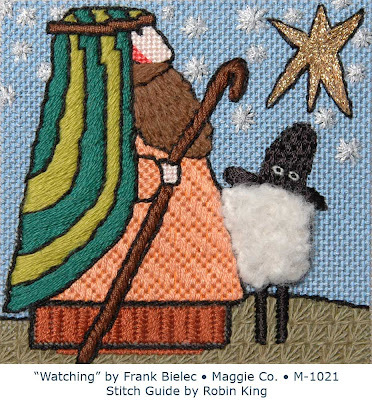 However, they will see you next month at the TNNA Nashville Needlework Market (March 2 & 3, 2013). 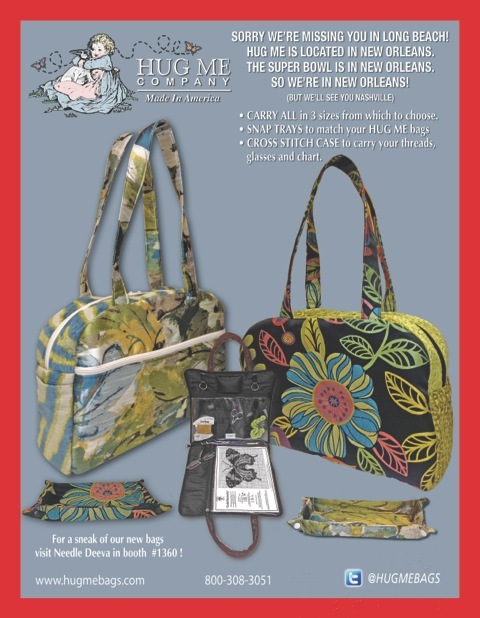 For a sneak peek of their new bags, visit the NeedleDeeva booth in #1360 at the TNNA Winter Market in Long Beach, CA. While at the Deeva's booth, say hello to Vicky De Angelis, Judee, the Deeva, her very self, and me. Look at this Hug Me brochure from the Needlework Retailer: Hug Me Company is making "new Snap Trays to match your Hug Me bags." 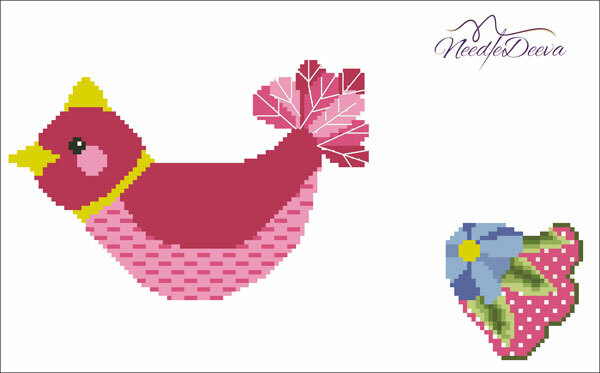 Visit their website: www.hugmebags.com. Your Favorite Needlepoint Shop can get them for you. Are you on Twitter? Tweet them @HugMeBags. 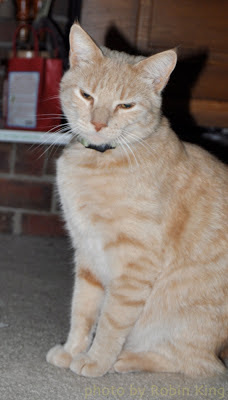 You can Tweet me, too... @catmom6. OK... tomorrow, I am doing a photo session of my new (!) finished Sugar Skulls. Wonder which cats will join me? I am enjoying this relaxing day: watching the Inauguration festivities and putting away some threads from recently completed projects. Happy Inauguration / Martin Luther King Holiday. Ribbons and Beads and Kreinik, oh my! 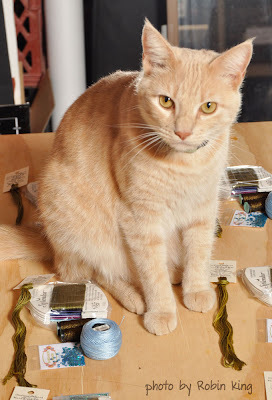 Soon, though, the frantic pace will be back, and I will be on to the next deadline: kitting the Thread Kits for the 2 TNNA classes. 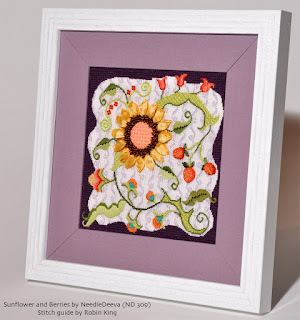 After TNNA Market, I will also be teaching the Sunflower and Berries (ND 309) at Needle in a Haystack (Montrose, CA) on Tuesday, February 5th from 10AM - 4PM. Give Jody a call (818) 248-7686 to join in the fun. There might be a nap in my future, too. Leo is calling. Leo, a good napping buddy. Another thing I've done recently is update the NeedleDeeva website. The Deeva has been very busy getting new designs ready for the upcoming TNNA/Long Beach show in February 2013. That's just a few weeks away! 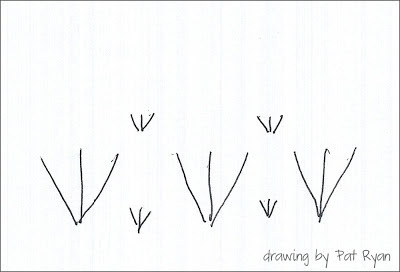 Clever and cute. That's the Deeva. And, all her designs are stitch painted. Here is a sample of What's New? 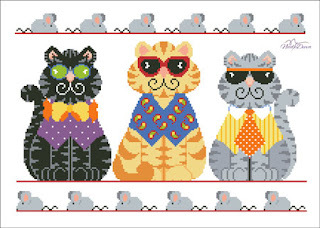 from NeedleDeeva for 2013. There are new cats, too. 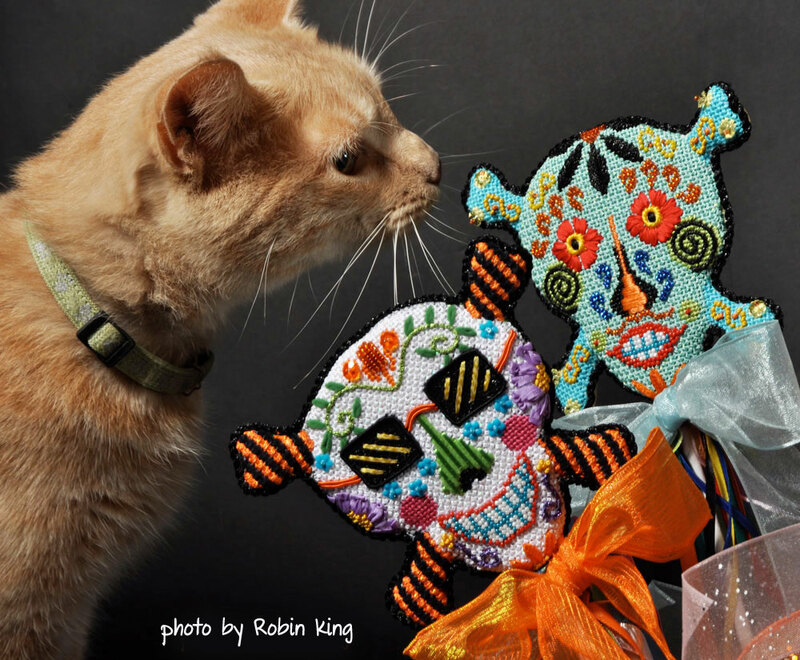 Judee named one of her newest cat canvases after my cat, Lana. Yes, I will enjoy stitching her. I sure do love yellow cats. "ooh, I love sparkly things"
To see more, visit NeedleDeeva/whats_new. 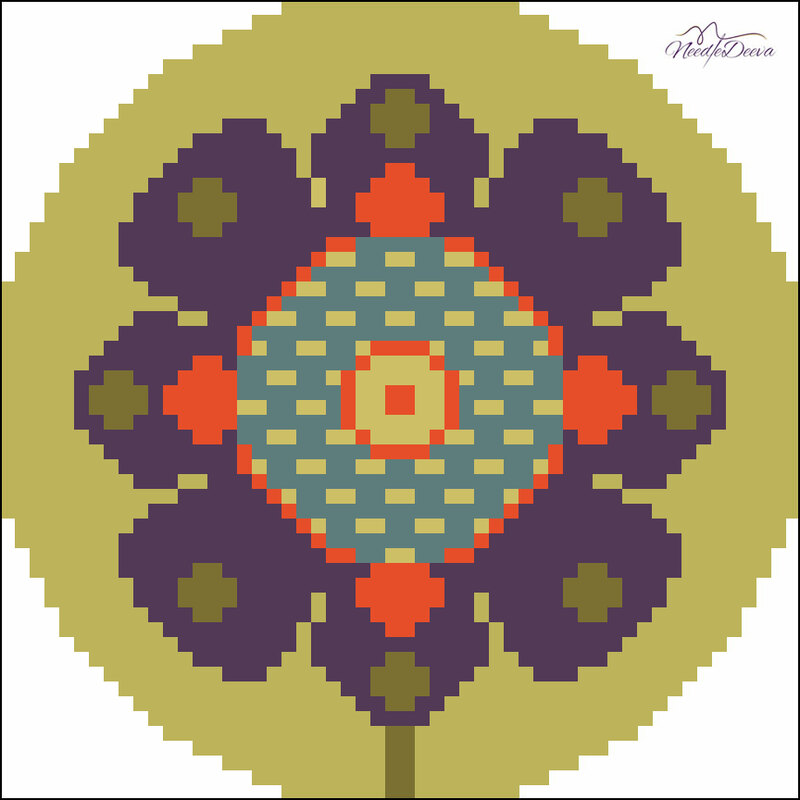 If you see any designs you like, let your favorite needlepoint shop know. They can place the order with the Deeva at Market. You can find her in Booth 1261/1360. Or, if they are not attending the show in Long Beach, they can just call or email the Deeva for the order. 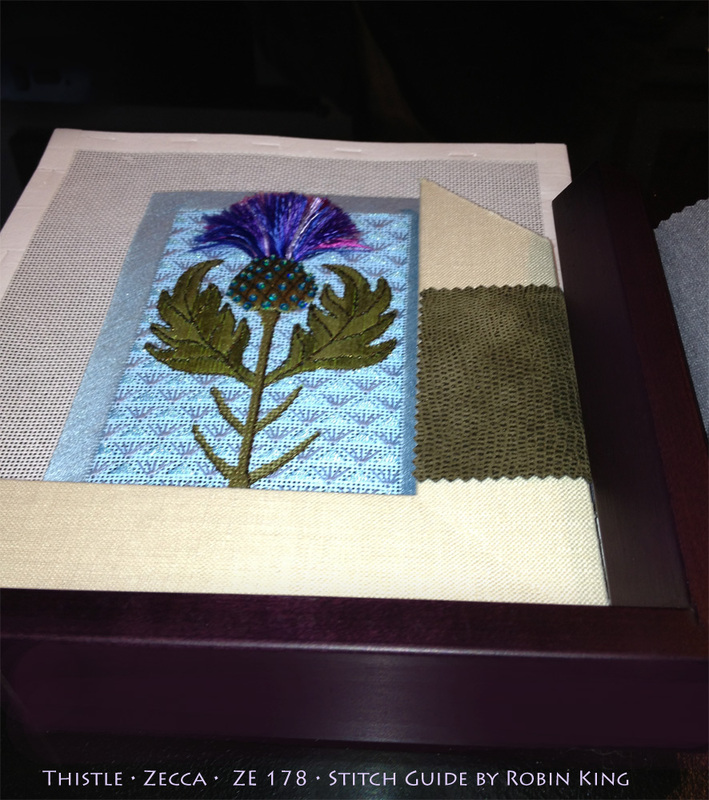 The Thistle is at the framer. 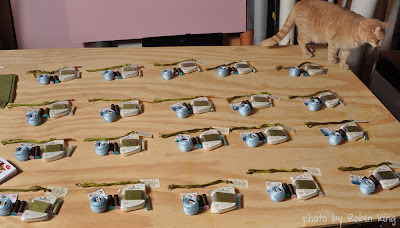 Getting all dolled up for the TNNA debut. Each time I go to T. Clifton Art, I clear my mind of any pre-conceived notions about frame choices. I let Tom's creative talents take the wheel. This time, we went Plum Eggplant for the frame and Gator Green for the liner. A very rich combination, indeed. Again, prior to being framed, I gave myself some "extra" room outside the design area for the frame to attach. Especially with the Thistle art so close to the design edge... breathing room was needed. I stitched across 9 canvas threads and once the frame is attached, about 4 canvas threads might be showing. 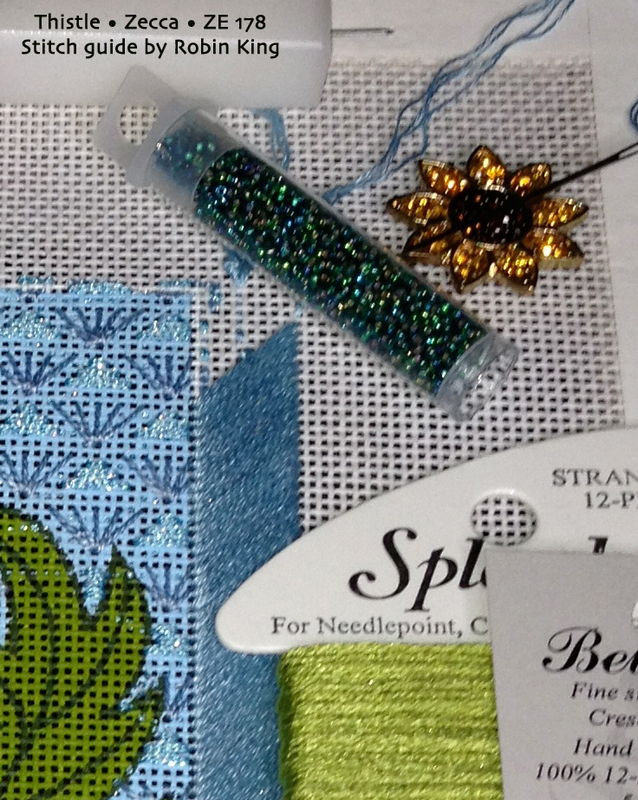 Bonus: the extra border was very helpful covering my beginning/ending threads. 9 extra threads to give some breathing room for framing. Notice my choice in magnet? The Sunflower. Guess what?.. the Thistle is in the Sunflower family. Who knew?!! 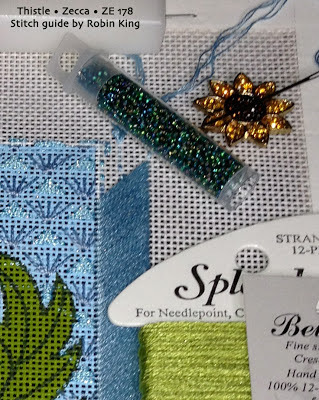 The Thistle has fun threads, too: Splendor, DMC Perle Cotton size 8, Petite Sparkle Rays, Belle Soie Silk Floss, Neon Rays, Kreinik, and Sundance Beads & Sequins. 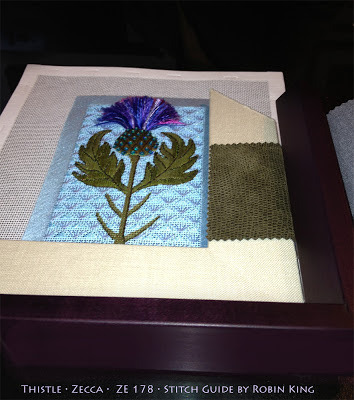 This Zecca canvas measures 3.5" x 5.5" on 18 mesh. It was a satisfying project to do. 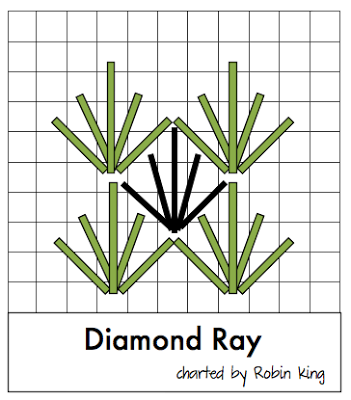 Time to write the Teaching Manual and begin printing stitch guides. 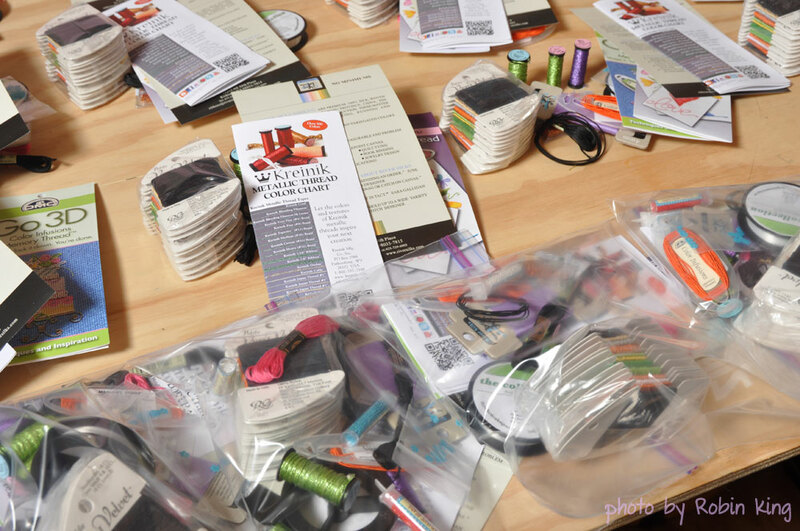 After that, will be the assembling the donated Thread Kits. Let you favorite needlepoint shop owner know (who is attending TNNA/Long Beach) there are still seats available for my class on Sunday, February 3. 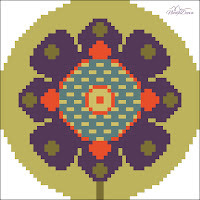 They will also be able to stop by the Zecca booth and order the Thistle canvas (ZE 178). 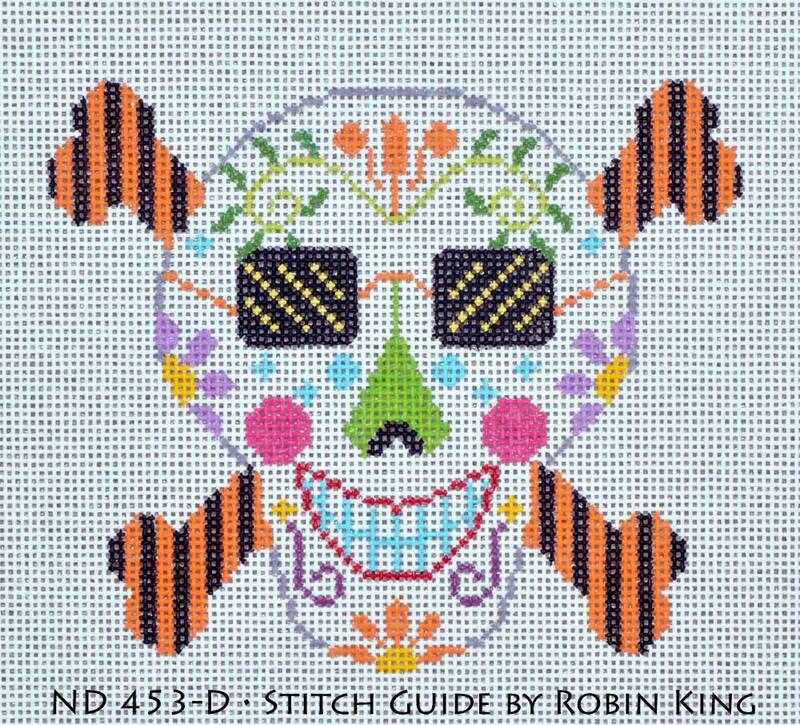 It comes with my stitch guide. 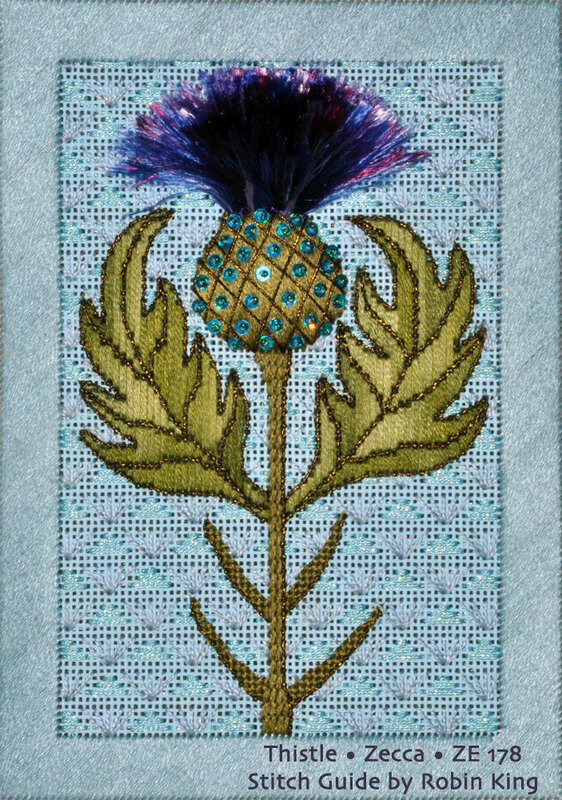 Soon, you can stitch your own Thistle. The Thistle is the second class I am teaching at TNNA in Long Beach. The canvas is by Zecca (ZE 178), measures 3.5" x 5.5" on 18 mesh and comes with my Stitch Guide. 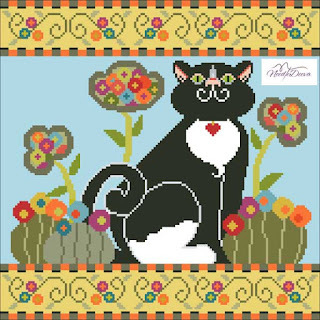 Another fun canvas to stitch by Zecca. 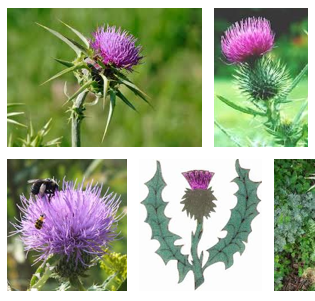 I had fun researching the Thistle: its origin, symbolism, and botanical details. Just look at these inspirations from Google Images. Again, as a class piece, I was looking for the "teachable moments" and boy, did I find some! 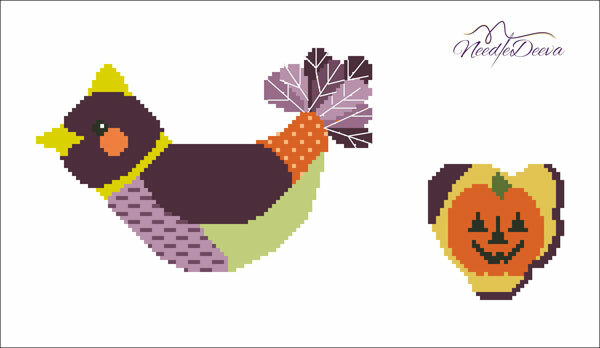 Turkey Work and Appliqued Felt were the first things which came to mind. And, as it turned out, they were the Stars of the Show. 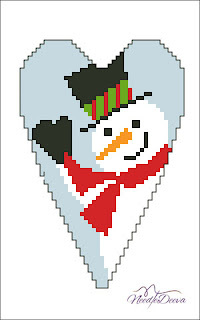 First order of business, though, was to figure out a Background Stitch. Initially, I thought about doing some kind of Celtic design. I was all over the place without much forward traction. 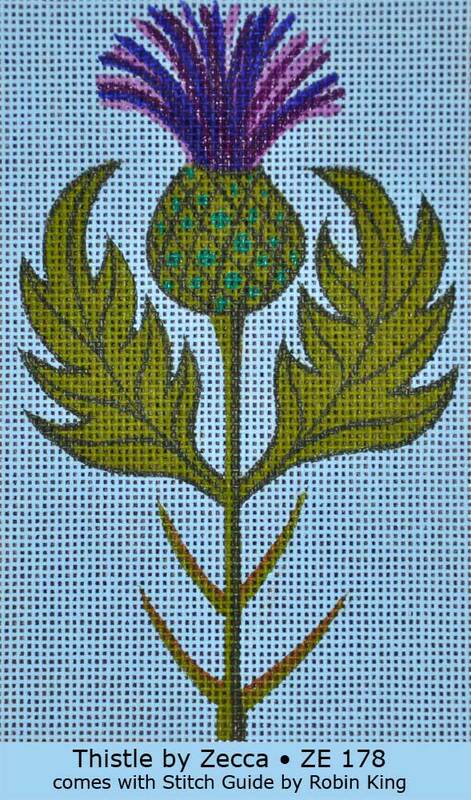 I asked Pat (my guy and owner of Business Visuals photography) what kind of background did he see for the Thistle? Have you ever done that? Asked a non-stitcher for their viewpoint? It can be very helpful. Grasses Stitch. My mind started thinking about the family of Fan Stitches also known as a Diamond Ray. Kind of looks like Grass, right? I have used it before (offset and slanted) for the Grass underneath the Shepherd in this endearing Frank Bielec canvas by Maggie Co. ("Watching" • M 1021). I added the Eyes to the Sheep... brings out the personality. But, for The Thistle, I wanted a "look" of Grass, but not so tightly covered. I wanted a more "open" look. 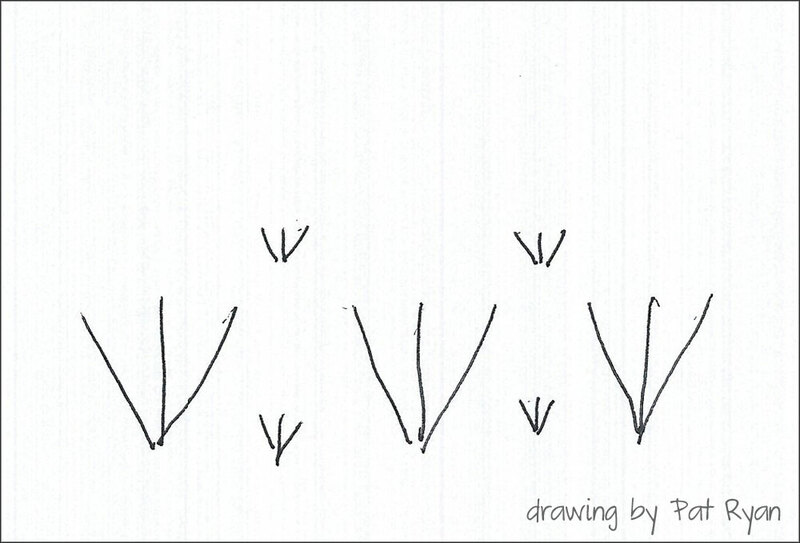 So, for something more open, take the design element and start spreading it out. I played around with it in Photoshop. (Truly a designer's best friend!) 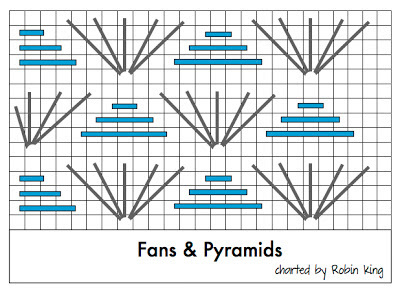 I repeated the Fans and filled in with Pyramids. I liked the look. Pat liked the look, too. Once stitched, we really liked the look. 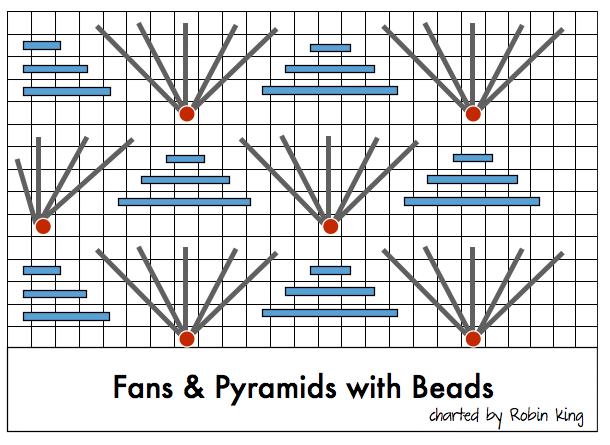 So, I am naming the background stitch: Fans & Pyramids. 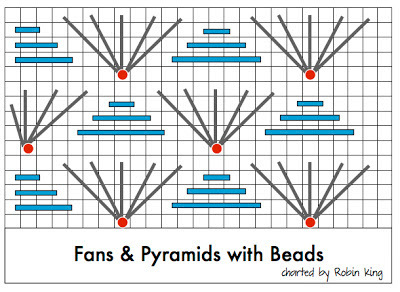 And, you can take it one step further by adding Beads: Fans & Pyramids with Beads. What's that you say? What about a little "bling?" 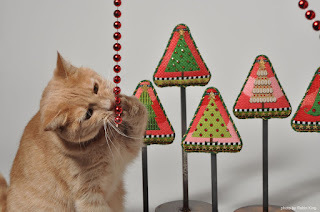 What about a Sequin and a Bead? Now, you are thinking like me. LOL. 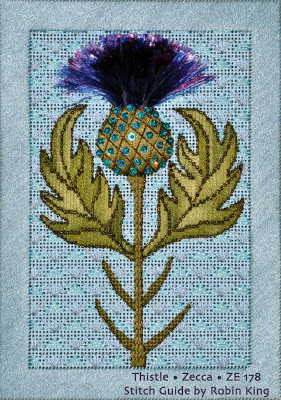 I'll be back with the finished Thistle in the next blog. 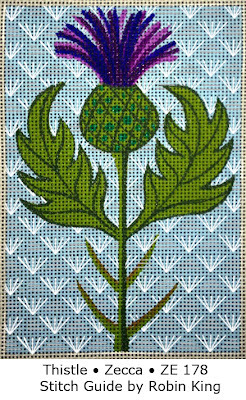 There are several seats still available for The Thistle class at TNNA on Sunday, February 3. Hope to see you there. Thank you, thank you, thank you for hanging with me... waiting for another blog. 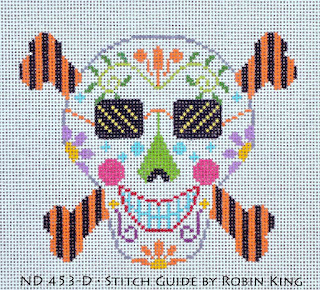 Sunglasses Sugar Skull "Elton John" by NeedleDeeva (453-D). 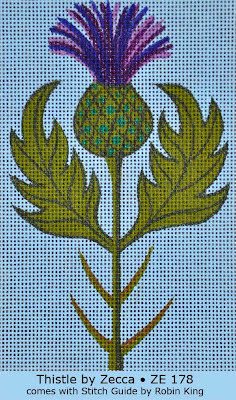 The Thistle by Zecca (178). Teaching at TNNA is an honor and thrill. The students are shop owners from across the country. What an opportunity. It is also a lot of work. 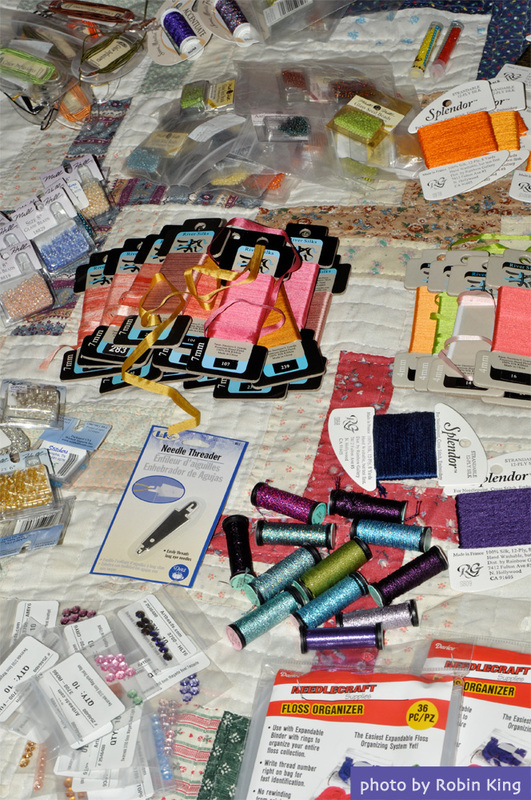 Stitching under deadlines, assembling donated thread kits, typing the teaching manual, printing the stitch guides, shipping all items to California. But, what an opportunity! Get your Map of the USA handy and see how many states you can identify. Is you favorite needlepoint shop owner taking the class? 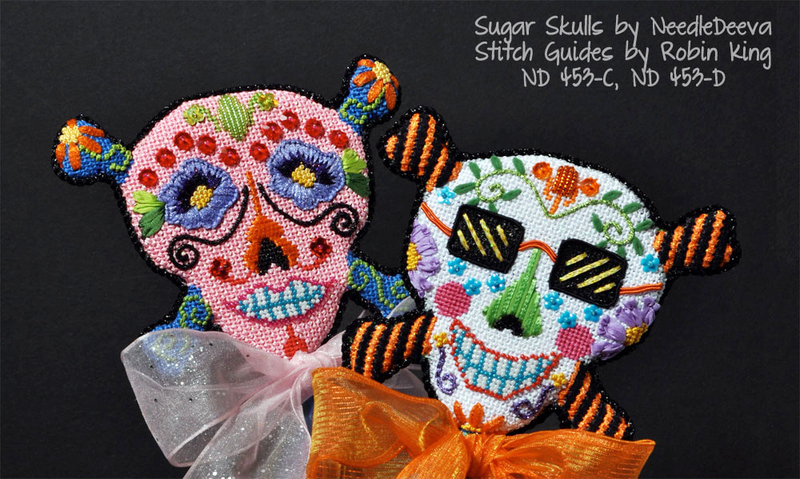 So far, shop owners from MA, OH, MN, GA, VA, SC, CA have signed up for the Sunglasses Sugar Skull class. 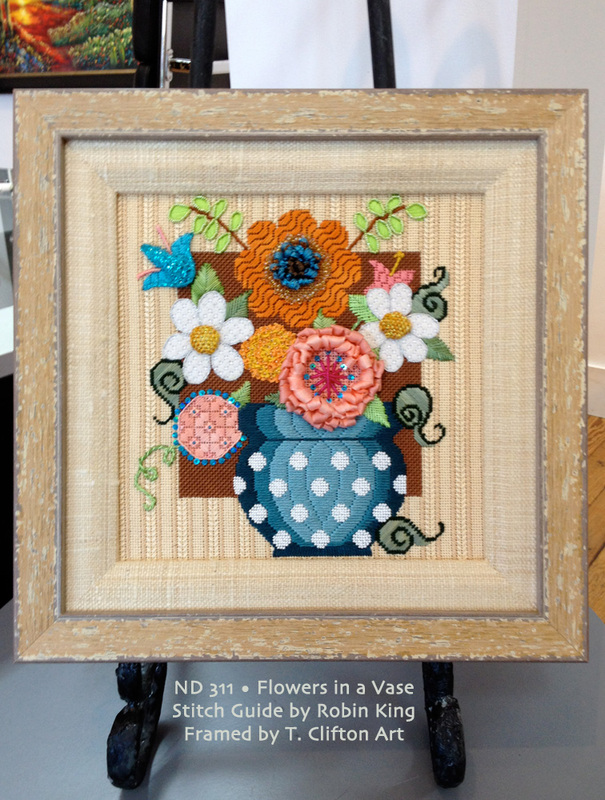 And, there are 12 seats still available for the Saturday class, February 2. So far, shop owners from KY, VA, MN, FL, TX, HI, MI, SC, MA, OR, and CT have signed up for the Thistle class. And, there are 9 seats still available for the Sunday class, February 3. Let's talk about the Sugar Skulls. 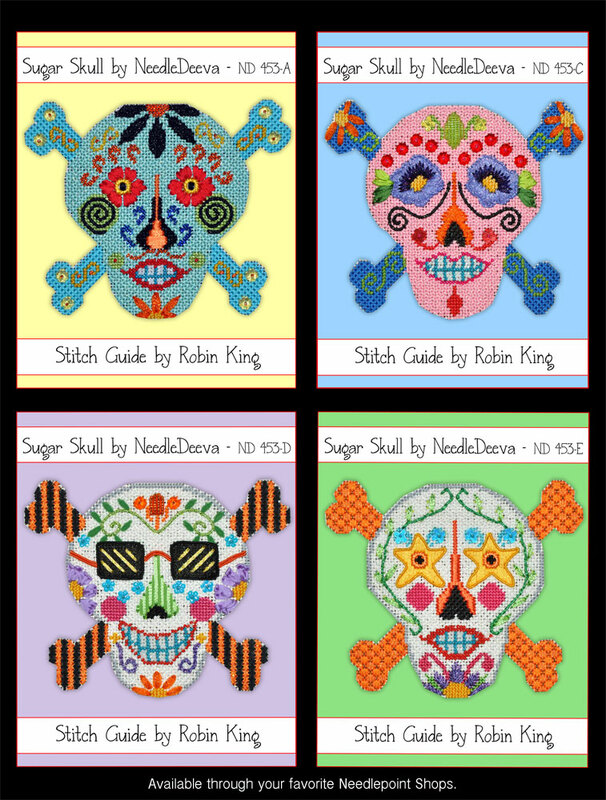 NeedleDeeva came up with some really cute Sugar Skull designs. Lately, I have been focusing on the 5 small ones. Actually, I do have 4 out of 5 stitched. They are at the finisher (Elizabeth Turner Collection in Lexington, KY), and we will be reunited at Market in just a few weeks. 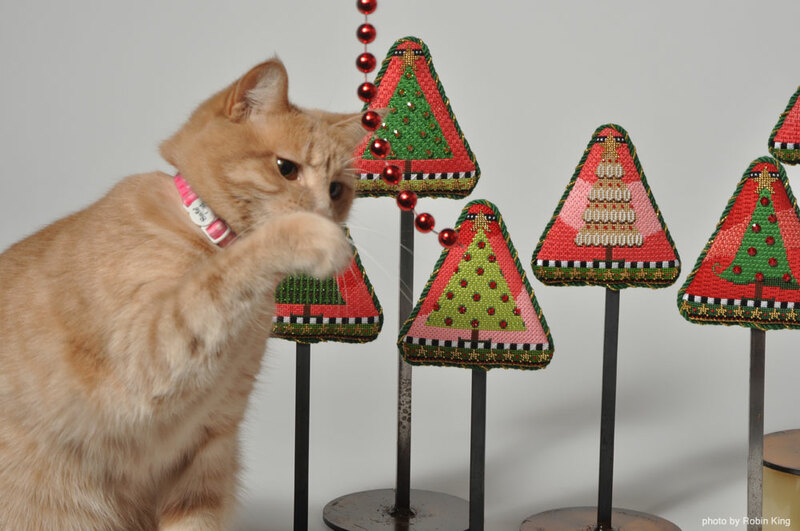 Purr-fect timing. 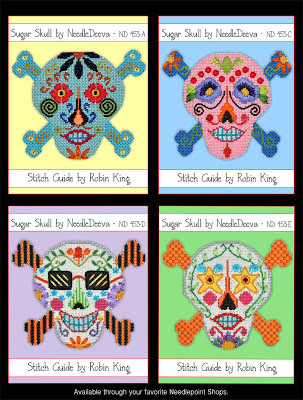 How to pick which Sugar Skull to teach? Talk about a Sophie's Choice moment! But, with any class project, I look for "teachable moments." The Sunglasses on this Sugar Skull were quite endearing, so I picked him. I was glad I did. Talk about fun threads: Flair, Glow in the Dark Neon Rays, Petite Sparkle Rays, Petite Very Velvet, Petite Frosty Rays, Neon Rays, Splendor, Sundance Beads, The Collection Sequins, Swarovski 6MM Margarita Crystal Beads, Kreinik size 8, Kreinik Hot Wire, DMC Memory Thread, DMC Floss, and River Silks Ribbons. I kept saying over and over again, "If not on a Sugar Skull... when! 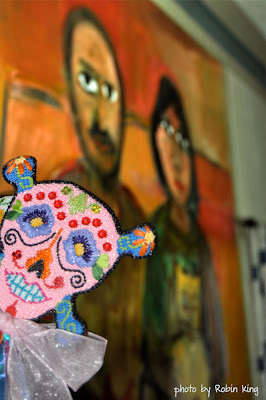 So, what was the "teachable moment" for the Sunglasses Sugar Skull? 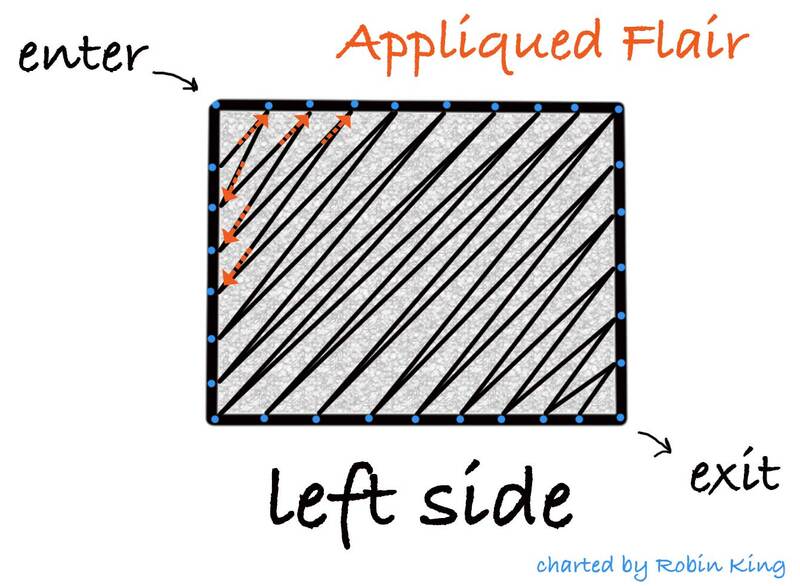 The Appliqued Flair technique for his sunglasses. 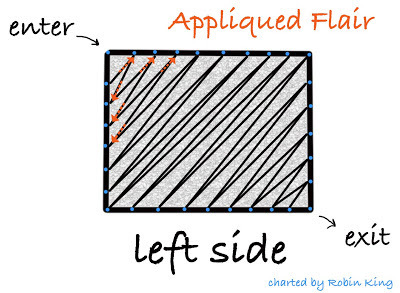 Have you ever done Appliqued Flair? It was taught to me several years ago by Amy Bunger. 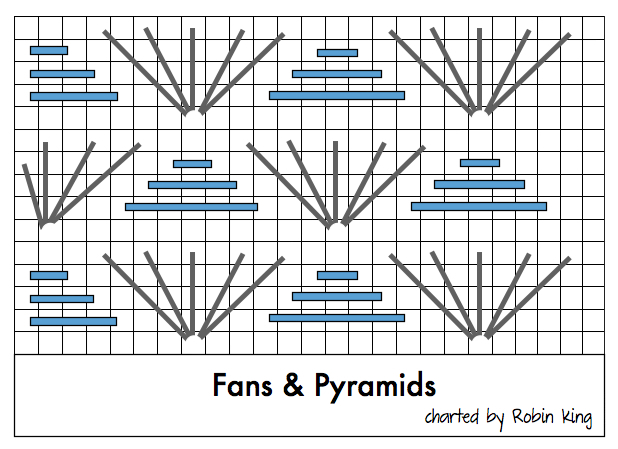 We also featured it in "Barely There"; DVD #6 from the How'd You Do That? series. 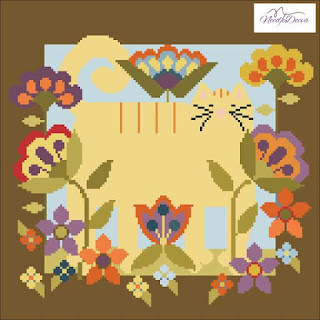 The idea is to stretch and tack down with one strand of floss (applique) the Flair across a surface. No under stitching is necessary; thus the concept of "barely there." The trick is to work across the surface, tacking as you go, working in a Zig Zag sequence which best uses the stretch of the Flair. After all, we do call Flair "Barbie's pantyhose." 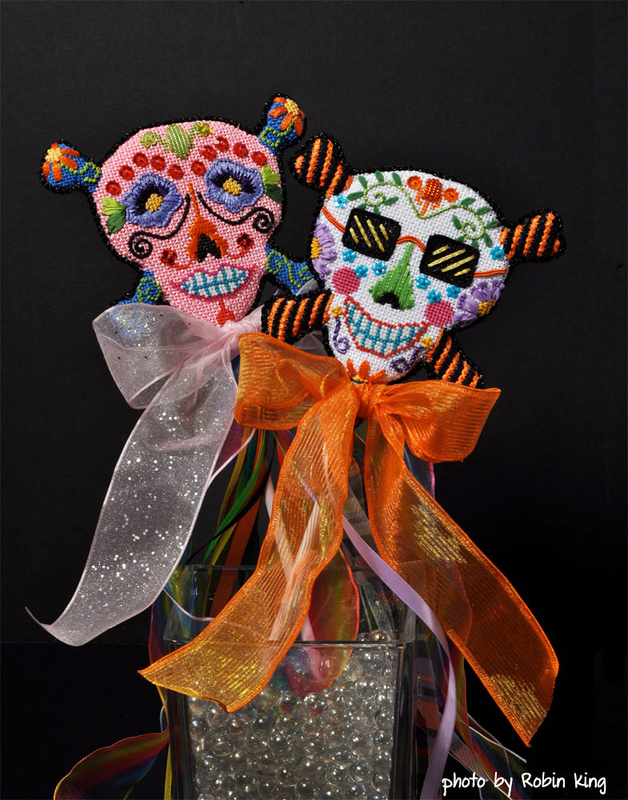 Here's the group of the 4 Sugar Skulls being finished. Can't wait for Judee/NeedleDeeva to see them. Next time, we will talk about The Thistle.